Since going gluten free almost 6 years ago, I’ve pretty much embraced what I eat nowadays. I don’t miss the bagged wheat bread, sticky white pasta, or the stale shredded wheat cereal that seemed to always be around. But there are a few exceptions to that statement… like a good pancake. One that isn’t dry, doesn’t taste like cardboard, and isn’t rock hard. After discovering this recipe a few months ago, my life has changed. These are not only delicious and gluten free, but they are quick to make, and loaded with protein! Give these pancakes a try and let me know what you think! Place oats, buckwheat groats, chia seeds, and help seeds in a high-speed blender (I love my vitamix). Pour in the boiling water. Put the lid back on the blender and let it sit for 5 minutes. Set a medium pan over low heat. After 5 minutes, add the applesauce, baking powder, vanilla, sea salt, cinnamon and maple syrup to the blender. Blend on high until you have a relatively smooth, thick batter. You’ll see little flakes of chia—no worries, this is fine. Lightly oil the pan and pour in ¼ of the pancake batter. Spread the batter to form a circle with a spatula. Let the pancake cook for a good two minutes on one side, or until the edges of the pancake are dry and the underside is browned. *** Carefully flip the pancake over and cook for another minute. Repeat this process for the other three pancakes. Serve the pancakes with fresh fruit, nut or seed butter, and maple syrup or honey. 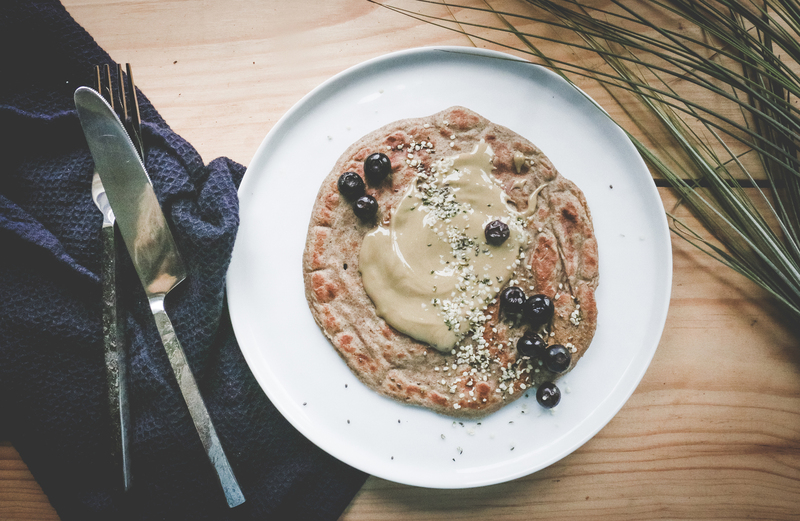 *Buckwheat groats are a great grain for gluten-free folk. They are pretty neutral in flavor and have a lovely, smooth texture. 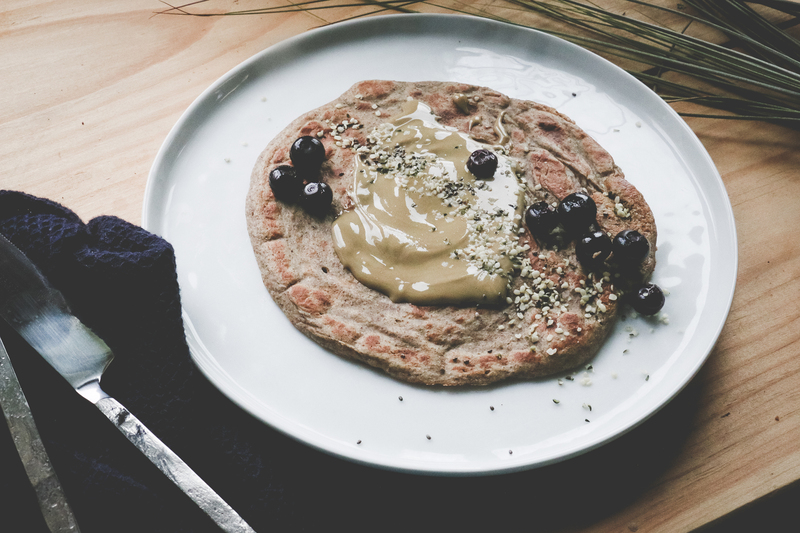 Buckwheat groats are loaded with protein, dietary fiber and B vitamins. They can be found in most large grocery stores or health food stores in the bulk foods or grains section. Of course, amazon is another great option for purchasing dry foods. **Another great source of pant-based protein. You can leave this ingredient out if you don't have these on hand, but I definitely recommend getting a bag. Hemp seeds are amazing and a big bag will last you forever. ***​The key here is to keep the pan temperature medium-low to ensure that the pancake cooks all the way through, so don’t rush it.